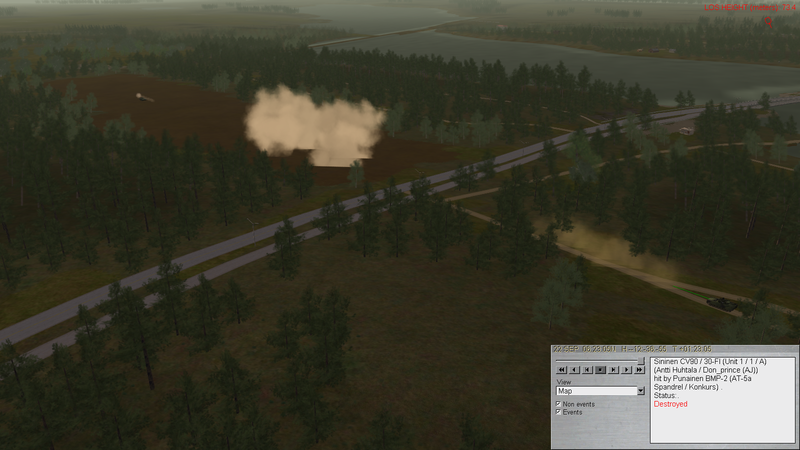 But the AI gunners seem to be just as accurate even when the hole area is covered in Smoke. 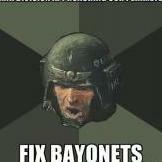 I have used it to great effect against T-72M1s. Either as an arty call or just the grenades from my 1A5. Maybe try changing position after popping smoke so the enemy loses track of you. Also, it's good to lay down overlapping layers if it's an arty call. The more, the better. Thanks for the advice. but i always do change position. I also find withdrawing under a smoke screen. not very effective. Even when i use multispec smoke the T tanks seem to be able to score hits. 2. try using he/smoke mix for screening. For some reason, smoke only barrages drop smokes identical to that of smoke grenades in terms of thickness and height, so it could be that smoke is not really covering you due to terrain features. so it could be that smoke is not really covering you due to terrain features. Smoke fired into low ground (relative to you and or "him") is a waste of ammunition. It could well be the case. Also on reflection it may be the case, although i am changing Position i am still being hit due to muzzle flash, as i am conducting a fighting retreat. And have a nasty habit of letting the enemy get to close.it may not be a good tactic but Sometimes i like to duke it out. So are you using the vehicle’s built in smoke grenades or artillery delivered smoke when you attempt to achieve this clean break? Co-ordinating artillery smoke and your move can be problematic. If you have used all the on board smoke grenades then a “smoke + HE” mix dropped on their position can achieve obscuration and potentially inflict damage / disruption as well. Now I almost always use HE/smoke mix whenever I need screening. In a stark contrast to smoke only barrage, HE mix creates very thick and high pillars of smoke in addition to dirt geysers that even partially blind thermals. Also the height of smoke pillars somewhat compensates for minor misreadings in terrain. Just make sure your impact area is not so wide that the smoke is spread too thinly. I was headed for the same response. I've found that a 200x100 box for 6 tubes is a good, dense field that will provide viable cover. Yes, there is multispectral artillery smoke (like the German DM125) that blocks thermals. Regarding the material covers, one thing I would like to see is natural camouflage in SB. It is pretty effective in hiding things from all sorts of ways of detection and readily available everywhere except desert environs. Why not materials like the SAAB's Barracuda etc. too, but definately natural camo as well. Some of the Guys have added foul age to skins. You will find them in the download section. "Concealment" rather than cover perhaps. Nah..it's a new bug. The smoke deflects anything up to 155mm that is shot into it. How do you set the smoke to regular or multi-spectral? I cant find the option in artillery request form. You can only do that with the smoke grenades on vehicles (depending on if they were carried). Artillery smoke (as in real life) is not multi-spectral. The artillery smoke modelled is the base eject type which takes a while to develop but correspondingly, lingers longer too. The smoke modelled is the base eject type which takes a while to develop but correspondingly, lingers longer too. Hey this might be related to this topic, since perhaps there is problem with smoke after all? I played mission with my friend. 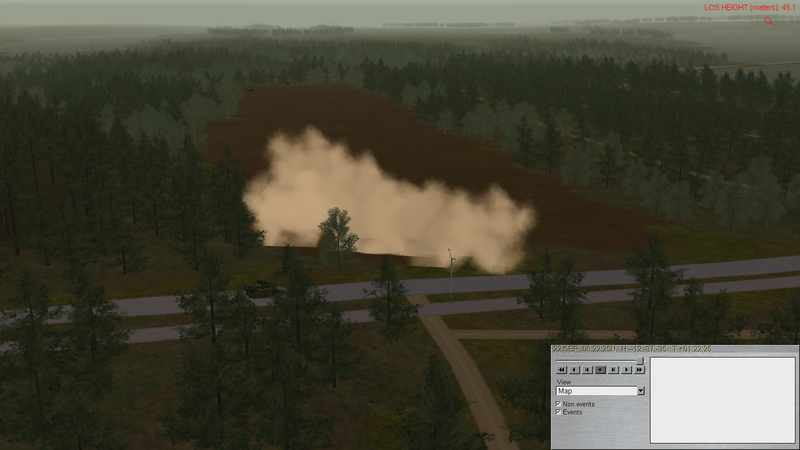 Where I was ambushed from side by bmp-2s I quickly popped smoke, and relocated to more safer area and more far away to wait for smoke to dissipate, and boom, i was hit by missile shot by bmp-2 trough the smoke, like 20 seconds after popping smoke. And I had relocated. 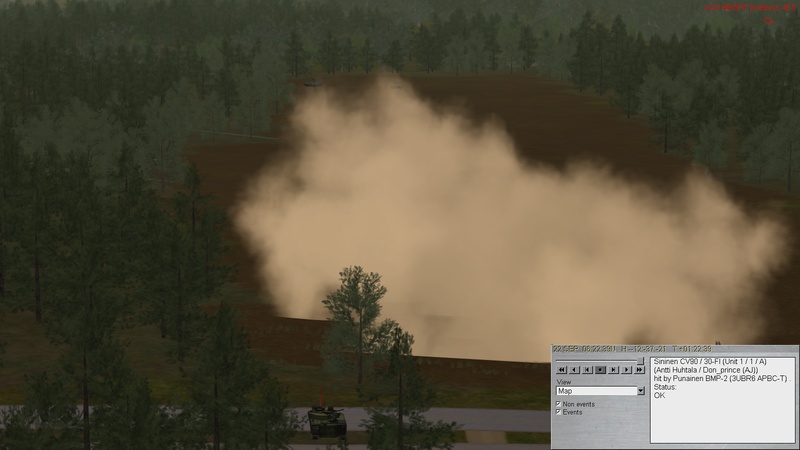 How comes that bmp-2 can fire missile trough the smoke that is so thick that cv-9030 cannot see trough it. And hit target that has changed its location? And even more so... like 20 seconds after smoke cover was deployed? 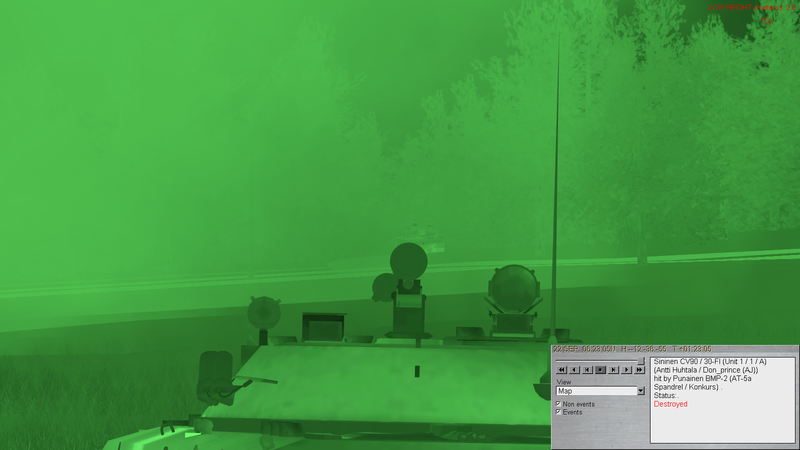 Or does bmp-2 have some super thermal vision that i have not been aware of? It "shouldn't happen" but smoke does not provide absolute safety. 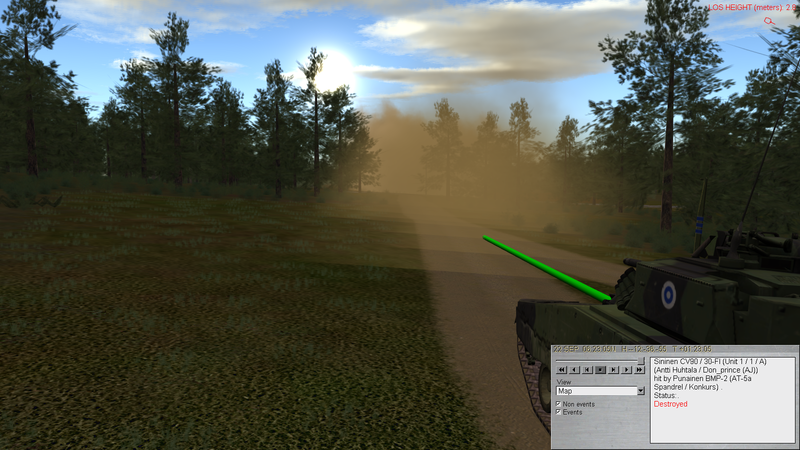 You did everything right (unless you relocated in direct extension of the line of sight of the attacking vehicle, in which case the missile, if fired on the last known position, simply kept going into the blind until you happened to be in the way, even if a few dozen meters later than expected). But even if you did everything right, sometimes you simply have a bad day. I agree with Ssnake. Missiles go ballsitic if not guided. Yes, I agree with you. And since human memory is not to be trusted, I went to check my AAR. And now I am even more confused. According to AAR I remember things correctly, even when situation was quite hectic. At around T+ 01 22:25 I drive into ambush along main road, I pop smoke, retreat towards concealment, and to possibly to engage enemy pc from edge of smoke while partially concealed by brushes, aiming to engage those one by one. I tell my driver to face them and gunner to look for targets. However my plan is flawed. Without me being aware, pc on the left hand side is able to see me, and I cannot see it because tree branch is blocking my sight. It fires at my hull with its auto-cannon for roughly 3-5 times without doing any damage at all, as you can see here. So time is +01 22:39 when I decide to play safe, and I once again relocate this time backing away to road that you can see begins just from my right side, and I intend to find place where I can engage after smoke dissipates and find cover would I need it. 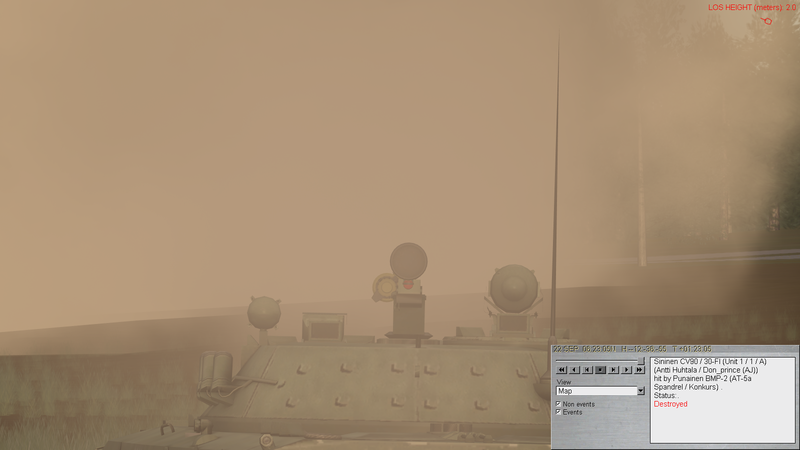 So my question is... how comes that at time +01 23:05 (as seen on previous post) right bmp-2 who has not seen me for more than half minute, nor fired any shot at me... fires missile on my hull while there still is smoke and hits, even after I have changed my location twice? Oh btw this was multiplayer session. maybe it has something to do to that? Though, I was host of session. Well, I did some testing. With cv90 and bmp-2s and well. Smoke seems to work correctly on plain open. This mission from where screenshots are from seems to be oddity, until proven otherwise. Strange thing btw.. it somehow seemed that regular smoke was more protective than multispectral, at least against bmp-2s, i dunno why that is. I need to do some more testing to get my minds ease to this.